Master Jia is giving a tour of a great wonder under construction when, upon entering the sunlight, he begins to spontaneously combust. Is this some divine retribution? Are supernatural forces at work? No, it is a case of murder in China, circa 690 A.D. When judges from China’s supreme court begin their investigation, it is soon discovered that phosporous has been used as a poison. But how was it delivered? Then moments later, the chief judge, about to report on the case to the Empress, dies in the same manner as Master Jia. The Empress—rightfully concerned that there may be those out to prevent her coronation—sends for exiled detective, Dee Renjie. She appoints him Chief Judge of the Empire and strongly encourages him to solve the murders before her coronation. After all, it was she who exiled him in the first place! With indisputable wisdom and unparalleled martial arts skills, Detective Dee—a cross between Sherlock Holmes and Bruce Lee—begins his investigation. He is aided by Jing’er, a female servant of the Empress, and Pei Donglai, an albino and junior member of the court. These three must learn to trust each other if they hope to solve the murders. This fascinating story mixes fiction with history and incorporates a bit of fantasy within the framework of a murder mystery. Detective Dee, known more correctly as Dí Rénjié (630 – 700), was a very real official during the Tang and Zhou Dynasties. He served as chancellor to Wu Zetian and is considered one of the most celebrated officals of her reign. He first appeared as a detective, a role loosely based on him, in an 18th century Chinese novel, Di Gong An. This novel was translated by the Dutch author, Robert Hnas van Gulik (1910 – 1967), who went on to write several mystery novels with Judge Dee as the detective. The Empress Wu Zetian (624 – 705) is unique in Chinese history in that she is the only woman ever to rule as Emperor and founded her own dynasty, the Zhou Dynasty, which briefly interrupted the Tang Dynasty’s rule. At thirteen, she served as a concubine at the Tang palace. She certainly must have been clever. Navigating court intrigues and politics, she rose to the status of Consort to Emperor Gaozong, and eventually, became the de facto ruler. Later, as Dowager Empress, she deposed her own sons and ruled China as her own dynasty for 15 years. This mystery is a clever one. The “fire beetles” used to poison the victims and characters who appear able to transform their appearance at will are, perhaps, more fantasical elements, but they fit in with the film’s mythical tone. The stunts, and near escapes, of Dee, Jing’er, and Pei are exciting to watch. Added to the political intrigues, both on the part of the Empress and those who wish to depose her, Detective Dee and the Mystery of the Phantom Flame is a rich story that deserves more than one viewing. Sets (both real and created with CGI) and costumes are a visual feast. The viewers first sight is that of the Empress’ statue, under construction, that towers over the imperial city like the Colossus of Rhodes or the Statue of Liberty. Several sailing ships, which seem ahead of their time, appear in the harbor. The movie, released in 2010, is rated PG-13 and is subtitled. 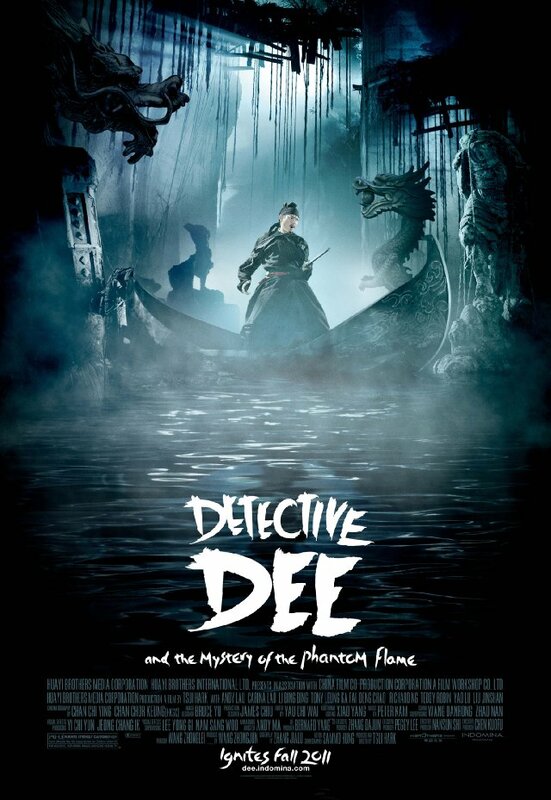 Extra features on the DVD include: The Making of Detective Dee, The World of Dee, Creating the Characters and Weapons, Stunts and Action. Worth watching to see how the concepts of the film were brought to life.